The standard tea bag has been around since1904 and hasn’t changed much since it began appearing in kitchens across the globe. Despite its resistance to change the tea bags has its issues! For one you have to wait for your drink to brew (or mash depending on which part of the country you’re from). Then there’s the consistency problem, with it being almost impossible to make a cup of tea taste the same as the last – change the size of your mug, brewing time or strength required and it’s easy to find yourself experiencing a very different tasting drink to the one you had before. Finally you’re left with a small damp bag you need to dispose of. 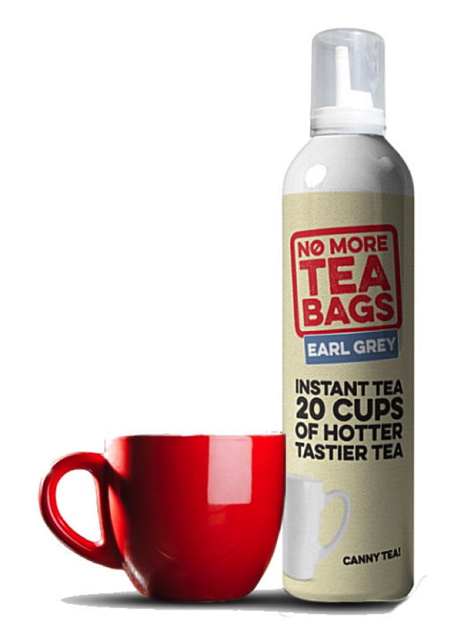 No More Tea Bags is based on a new patent pending technology which allows for high quality liquid teas to be contained in an aerosol style recyclable can. This means tea can be dispensed into a mug, hot water and milk added and the perfect cup of tea created without the need for waiting for brewing or having to mess about with and dispose of tea bags. It’s not just the traditional tea market that No More Tea Bags will appeal to. Alongside Original and Earl Grey varieties, there is also a Jasmine Green Tea in the range. The drink captures the taste of high quality jasmine green tea in this convenient and easy format and, as with the Earl Grey version, is created using leaf tea, rather than fannings.